Vancouver has not fared well against San Jose thus far this season. Of course, no one has been able to accomplish much against the Sharks. But the Canucks have had a particularly rough time of it. 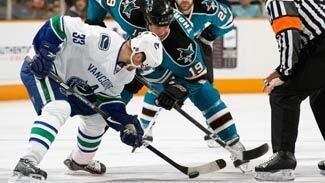 Late last month, the Canucks paid their first visit of the season to San Jose and were completely outclassed. They were defeated by a 5-0 margin and it wasn't even that close. The Sharks scored all of their goals before the game was even 21 minutes old. Then last week, the Sharks came into Vancouver and skated away with a 4-2 win, getting stronger as the game progressed and putting away the victory with a third-period outburst. Tuesday's game at San Jose presents the Canucks with another chance to show they belong on the same sheet of ice as the Sharks. This time, they should be at full strength. For one thing, Mats Sundin should be getting increasingly comfortable with his new team. For another, the Sharks probably will be facing Roberto Luongo. In their two earlier wins against Vancouver, Luongo was sidelined with his groin injury and the Sharks faced Cory Schneider and Curtis Sanford. Halfway through the season, the Northwest Division is flying under the radar in the Western Conference. For one, the defending Stanley Cup-champion Red Wings reside in the Central Division. For another, the Sharks lose only about once a month and are running away with the Pacific. But those who would overlook the Northwest should do so with caution. The Flames have been sizzling for two months now, and even knocked off the Sharks recently. The Canucks just added Mats Sundin and are in second place even though star goalie Roberto Luongo has been sidelined for a big chunk of the season with a groin injury. Things aren't quite so rosy elsewhere. The Avalanche have been snowed under by injuries. The Wild have struggled to deal with the Marian Gaborik contract/injury fiasco. And the Oilers have been inconsistent. Player of the First Half: Jarome Iginla, Calgary -- This probably should come as no surprise. Now in his 12th season with the Flames, Iginla continues to be one of the most complete and durable players in the game. Iginla led the Flames into the Stanley Cup Final a few years back, and he's having another big year this season. Last year, Iginla scored 50 goals for the first time in his career. This year, he's a bit off that pace, but his assists are up, and most importantly, the Flames have taken control of the Northwest Division. Despite his typically strong year, Iginla was only sixth among forwards in the Western Conference in All-Star voting by fans -- an indication of how teams and players in the Northwest tend to be overlooked. "Iggy's been having a pretty good year. I don't know why the fans voted that way," said teammate Daymond Langkow. "That's the way it is." Iginla had 21 power-play points through the first half of the season and 3 game-winning goals. He was added to the All-Star team by the coaching staff. Coach of the First Half: Tony Granato, Colorado -- Granato, in his second stint as the Avalanche's coach, deserves a world of credit. Despite major injuries to Joe Sakic and Paul Stastny, his team remains in the mix for a postseason berth. Right now, as they wait for their two leaders to return, they are winning enough games to give themselves a shot. As a player, Granato personified grit. He's getting a similar effort out of this year's crew. "The one thing you realize as a coach and an athlete, there's injuries and you never really have a full, healthy lineup and that's just part of being in professional sports or probably any sport," Granato told the Denver Post. Rookie of the First Half: Adam Pardy, Calgary -- This has not exactly been the Year of the Rookie in the Northwest Division. There is no first-year player putting up gaudy statistics here. But 24-year-old defenseman Adam Pardy is having a solid season for the Flames. He's playing more than 15 minutes a night, and though he had only 1 goal and 4 points through the first half of the season, he's been a reliable addition, posting a plus-4 rating. He got his chance to play regularly following an injury to Jim Vandermeer. Pardy is a 6-foot-2, 206-pounder who was drafted by the Flames in the sixth round of the 2004 draft. He's worked himself up from the AHL and ECHL into a full-time role on one of the better teams in the NHL. "It's exciting being out there and playing in the NHL," Pardy told reporters. "There's nothing better. It's what you dream of growing up." Surprise of the First Half: Kyle Wellwood, Vancouver -- It would have been impossible to predict at the start of the season that center Kyle Wellwood would be the Canucks' second-leading goal scorer. The Canucks themselves couldn't even have foreseen it. After all, early in the year they sent him through waivers and demoted him to the minors. His conditioning was part of the problem. Wellwood was back quickly, however, because of injuries, and he's made a big impact on a team that didn't have a great deal of firepower before adding Mats Sundin to the lineup recently. Lately, Wellwood has slumped a bit. Now, he's skating on a line with the Sedin twins, which could get him revved up again. "You've got to be real quick and create some open ice (with the Sedins)," Wellwood told the Vancouver Province. "We're going to need to put the puck in the net to stay together. For me, I like playing with those two because they're creative and quick thinkers. They stretch the ice. It's a much easier game for me to play." Around the Northwest -- The Canucks have held up fairly well in the absence of injured star goalie Roberto Luongo. But that doesn't mean they aren't happy that he is over the groin injury that sidelined him since Nov. 22. The Canucks have relied on veterans Curtis Sanford, since waived, and Jason LaBarbera, and rookie Cory Schneider, since Luongo was injured. ... Colorado defenseman Jordan Leopold recorded his 100th career point by scoring a goal in a victory against the Penguins. ... The Avalanche has found an answer to their problems in the absence of Joe Sakic and Paul Stastny. They've moved winger Wojtek Wolski into the middle and he's performed well there. It's just what the Avalanche needed to keep alive their playoff hopes in the absence of two top players. ... There's a paradox in Calgary. The Flames have soared to the top of the division, but they've done so even though star defenseman Dion Phaneuf is having a sub-par year. His offensive numbers are down and his plus/minus rating is poor. The Flames are being patient. "Understand, I'm not letting him off the hook," associate coach Jim Playfair told the Calgary Herald, "but Dion's no different than any other young defenseman in this league. He has to work on defensive details. Stick placement. Gap control. Zone coverage. It's very, very hard to play good defense at the NHL level. It took awhile for Robyn (Regehr) to get to the stage he's at now -- which is solid. Dion's so dynamic offensively, it comes so naturally to him. The defensive side requires time and patience and teaching." ... The Oilers are struggling this year, but they will celebrate their storied past Friday in a rally at Edmonton City Hall. The event will in honor of Glenn Anderson, one of the key cogs during the Oilers' Stanley Cup years. The franchise is retiring his No. 9. ... The last month was supposed to be when the Oilers caught fire. After all, their road-heavy start of the season was behind them, and they were looking forward in mid-December to two months played mainly at home. But the Oilers have not taken advantage, and the schedule turns back against them next month, when they have a stretch of nine games in which eight are away from home. Nine of the first 13 games in March also are on the road. ... In February, it will be the Wild's turn to try to take advantage of the schedule in the way that the Oilers have not been able to. The Wild will be at home for all but one game the first three weeks of February. Perhaps the team will benefit from the fact that, at least for a while, the Marian Gaborik situation has been pushed to the background. Gaborik had his groin surgery last week and will miss up to 14 weeks. So all the distracting will-he-be-traded, won't-be-traded talk will go away for a while.